pseudoparanormal: Woman Onboard a Ship Will Bring Bad Luck. 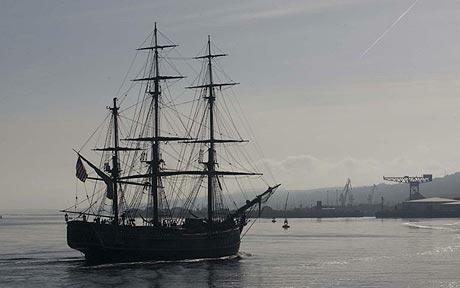 Looking for comfort at sea, sailors have a long standing tradition of being superstitious. One of these traditions is that having a woman on the ship will bring bad luck to the ship and it's voyage. One article stated, that sailors once believed that having a woman on board a ship would anger the gods of the sea. This would bring about violent waves and disastrous weather conditions. It is believed that in rare cases, woman were sometimes thrown from the ship to seek the forgiveness of the gods. One possible origin of this myth is that the woman were a distraction to the crew members. At the peak of these supernatural claims, the voyages across the ocean would take months to complete. A lot of attention would be paid to the only woman that they would see for these long periods of time. The crew members may have feared that having a distraction from the ship's needs may lead them into harm's way. Another possible contribution to this superstitious belief is that it was traditionally believed that women were not as physically or emotionally capable as men. The food onboard a ship was limited and bringing a person that was believed to be less able and significant was not a great option considering that they would still need rations to survive. In contrast to the original myth, there is also the belief that a woman would be good luck for the ship. During the nineteenth century, images of woman became popular subjects for ship carvers. 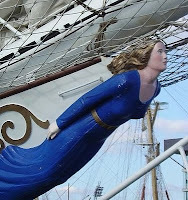 Figureheads are carved wooden decorations that are found at the prow of ships. Many of these figureheads represented woman which were said to calm the ocean and bring the ship safely back to shore. There is no evidence of women being back luck for a ship or its crew, however these superstitions are still myths that exist in present day societies. These superstitions reminds me of the 10 percent of our brains myth because although there is no proof is continues to exist as a superstition. This myth has been made popular even in popular culture through mention in movies just like the 10 percent myth in the film "Limitless." The woman on a ship myth has been referenced in the "Pirates of the Caribbean" movies. I heard of this myth before seeing it in movies but never payed much attention since my grand parents had a boat since I was little. Despite both going on it nothing never happened that couldn't have happened to either. I think that the figure heads are in their own mythos though. I've heard of this superstition before too, but it's obviously bogus. There were actually a few successful female pirates in history.